This page will include Signed First Editions by Clive Cussler and his coauthors, including Limited Editions, ARC's, Large Print, Foreign Editions and hard to find memorabilia. Price includes media mail shipping in the US. You do not need to be a member to purchase. The "Collector's Guide To Clive Cussler" by Wayne Valero was a huge hit among collectors. After a couple of years, they were sold out and being listed on Ebay for hundreds of dollars each. 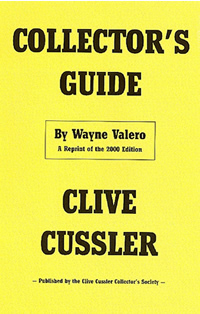 We saw the demand was still strong, so the CCCS re-printed "Collector's Guide To Clive Cussler" with a yellow cover titled "Collector's Guide" indicating that it was a reprint of the year 2000 edition. Signed by Wayne Valero, Clive Cussler and Paul Kemprecos. 8.25"x5.5" trade paperback. 262 pages. $30.00 includes media mail shipping in the US. We also have un-signed editions for sale. 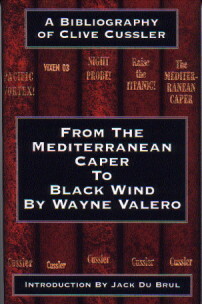 Wayne Valero's bibliography "From The Mediterranean Caper to Black Wind" went to the next level, covering Uncorrected Proofs, UK Editions, Hardcover Editions, Book Club editions, Paperback Editions, Pirated Editions, Econo-Clad editions... If it came out in print, it was listed. Printed in 2005. Signed by Wayne Valero, Clive Cussler, Paul Kemprecos and Jack Dubrul. 8.25"x5.5" trade paperback. 376 pages. $30.00 includes media mail shipping in the US. We also have un-signed editions for sale.